I love anything cheesy and green! This is easy to make and is so yummy. There are many many variations of this dish. This is my spin on it and the one that I found my family liked the best. 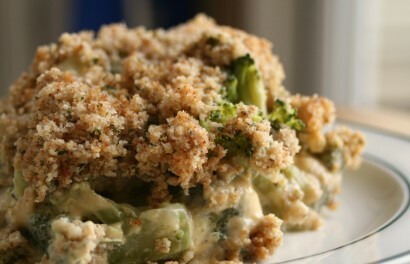 Cheese, broccoli, bread crumbs all combined and baked in the oven. Preheat oven to 350 degrees. Cook broccoli as directed on package (don’t overcook it) and drain. Mix together soup, milk and cheese in a sauce pan on low heat and cook until cheese is melted. Season with salt and pepper to taste. Place broccoli in a 9 by 13 inch oven proof dish. Pour cheese soup mix over the top. Mix melted butter with panko and parmesan cheese. Sprinkle over broccoli mixture. Bake for 30 to 40 minutes at 350 degrees F (175 degrees C).